Where does inspiration come from for your personal work? For me, it comes not only from the world around me, but also from images I see, particularly in my journeys as a collector. I read voraciously (my house movers can attest to that when they brought 50-odd boxes of books up two flights of stairs), I collect vintage anonymous vernacular work, I go to openings, and I consume as much visual media as I can. And by little I do mean little – it’s 3 x 2 1/2 inches, smaller than a carte-de-visite. I was fascinated by the brilliance of the composition – even though this was most likely taken with a little box camera using 127 size film. The photographer posed the subject in such a way as to achieve near perfect symmetry of the subject’s form, contrasting with the dynamic sweep of the backdrop fabric. The style and lighting reminded me of the modern work of a photographer I admire – Reuven Afanador. Reuven’s work has a very ‘vintage’ feel to it, and this body of images is highly reminiscent of 19th century wet-plate work. 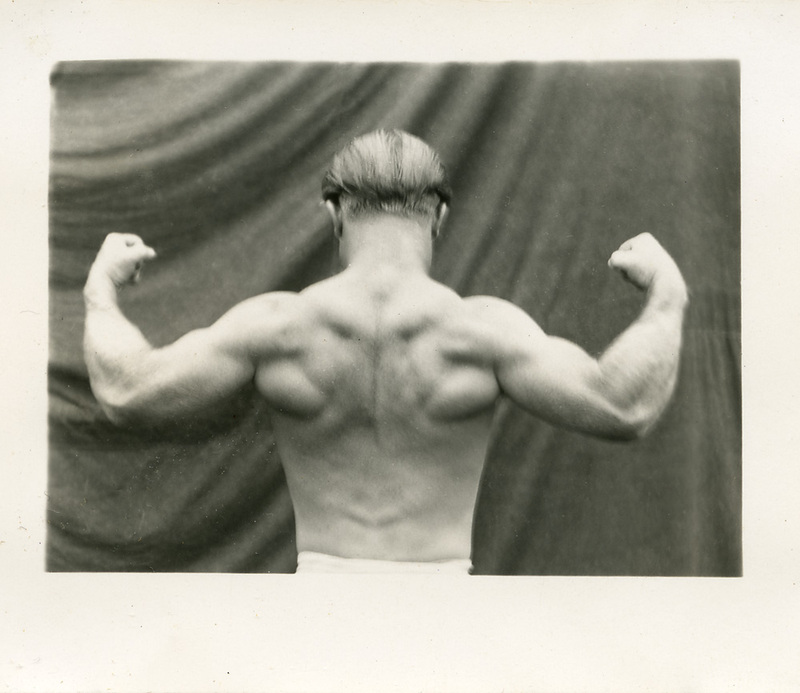 Finding this little photo of the bodybuilder inspired me to shoot a new series working with the same kind of backdrop and lighting. Ideally with a daylight studio, but I’ll take what I can find right now as I’m studio-less. Original print roughly 4×6, in a cardboard passé-partout with the photographer’s imprint Henline (or is it Henune – hard to tell from the typeface), Klamath Falls, Oregon. It’s another image that’s fun to speculate on the relationship between the sitters – most probably just friends, but who knows? It’s the odd-couple pairing that inserts the questions as much as anything else. 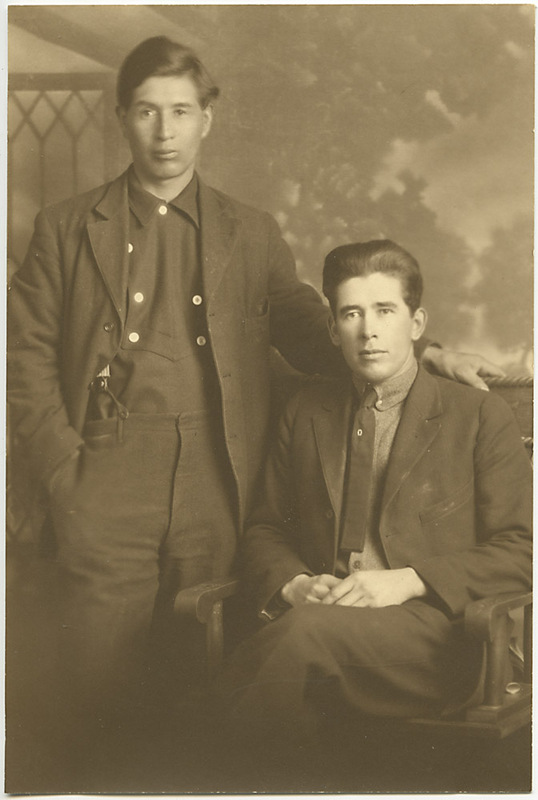 Unlike other, older tintype photos of two unrelated men together, there’s no obvious physical affection occurring. Is the absence of affectionate gesture a sign of “just friends”, or is it an indicator that by the 20th century, affectionate gestures between men were no longer acceptable, even when it was “just friends”? 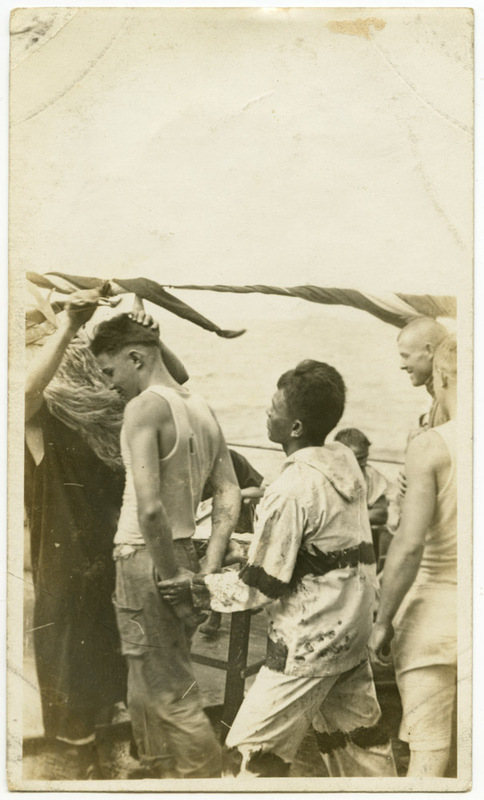 Here is a vintage silver gelatin print of a sailor’s ritual head shaving on his first crossing of the equator. Note the “mermaid” in long blond wig administering the shaving, and the asian sailor restraining the recipient of the haircut. This must have been a merchant ship, possibly in the Pacific, pre- WW II. In any case, a fascinating snippet of nautical culture as seen from an insider’s perspective. 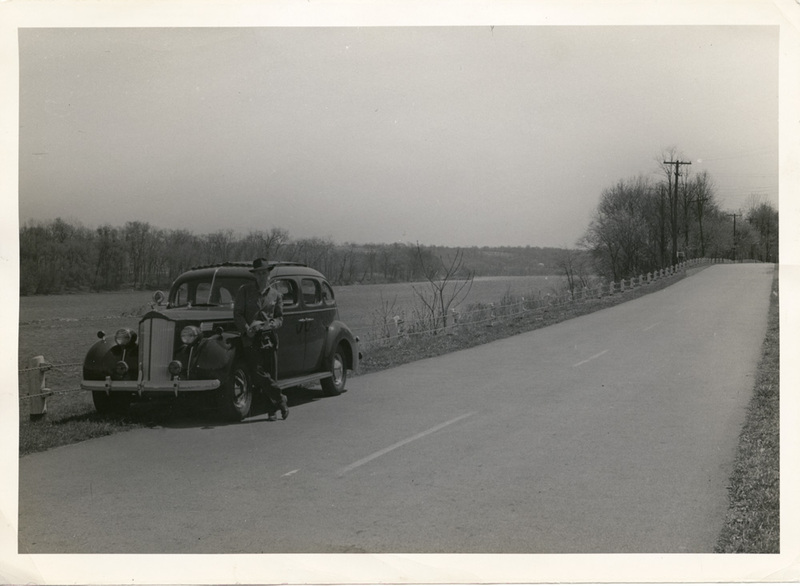 Here’s a neat anonymous vernacular photo of a man, his car and the open road – it’s in many ways the American archetype. The car is a 1938 Packard (appears to be a Packard 120, their ‘entry level’ model, sort of like a Mercedes C-Class today). Despite the fact that the car is a near-luxury car, this is so emblematic of the American psyche – a man and his car on the open road, the spirit of freedom and independence. It’s also remarkable to see how far the American roadscape had come by 1938 from 1919 when then-Lt.Col. Eisenhower crossed the country in a military convoy averaging 5.6 mph, requiring 573 hours to cover 3250 miles. Less than 10% of the road surface in the US was paved in 1919. I took the same approximate route Eisenhower did, in 2000, and it took roughly 42 hours (3 1/2 days at roughly 12 hours a day). 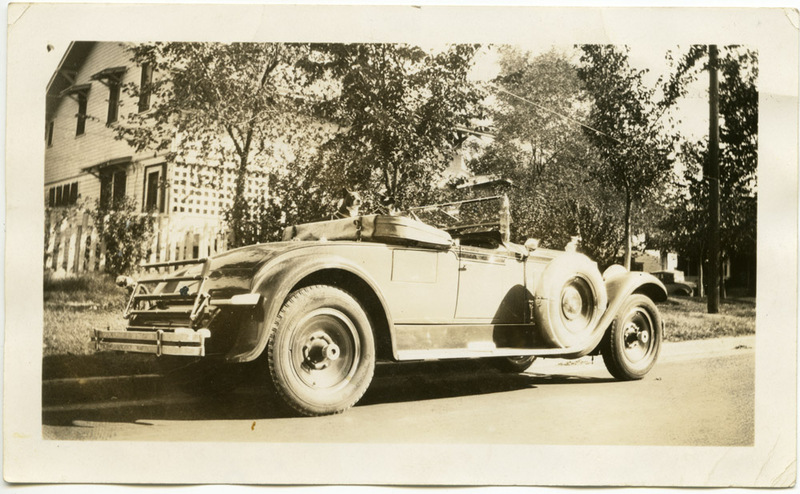 Here’s a snapshot of a 1930 Packard Big Eight roadster (I’ll give a fudge factor of -1 to -2 years, but I’m pretty confident it is a 1930). Notice the golf bag door in the rear fender, and the terrier sitting on the convertible top. It’s definitely a Packard – the wheels and hubcaps are pretty definitive, but the absolute dead giveaway is the hood ornament.